Lewis Hamilton and Valtteri Bottas secured a perfect qualifying result for Mercedes as the Silver Arrows will start from the front of the grid at tomorrow's Abu Dhabi Grand Prix. Ferrari and Red Bull will follow on the next two rows on the grid. As the sun was edging ever closer to the horizon, and track temperatures started dropping, qualifying kicked off with both Sauber and McLaren cars venturing out on track as soon as possible. Williams and Toro Rosso soon told their drivers to join the party, making use of a reasonably quiet track. None of those surprised on their first laps, though it was Leclerc who was the fastest of these early runners. The top teams then only came out on track around 7 minutes after the start of the session, with both Ferraris ending up fastest. Hamilton was a close third after these first laps, but even with everybody on the hypersoft tyres, most opted to do several laps on a single set, indicating the tyres needed a bit of running to get up to temperature. Both Ferraris for instance did two hot laps with one slow lap in between while both Mercedes included two slow laps, though some of that may have been due to traffic. Eventually, it meant that in Q1, Vettel, Bottas and Hamilton were within 0.053s. Behind them, Alonso and Magnussen just managed to get through to Q2, contrary to Gasly. The Toro Rosso driver endured a big loss of power when accellerating out of the final corner, and a few turns later parked his car alongside the race track. This sealed the fate of both Toro Rosso's, Vandoorne and both Williams drivers. Q2 kicked off with Hamilton and Bottas, soon followed by both Red Bulls, all on ultra soft tyres. Hamilton was very much on it, and set a time that no one came close to on their first attempts. In fact, the Brit was 7 tenths faster than Bottas while both Ferrari's were third and fourth. Ricciardo was 5th while Verstappen curiously ended up 10th and was very much in need of a better lap at close to the end of the session. Times tumbled at the end, especially in the elimination zone, and Verstappen found himself 13th 1 minute from end end. He eventually went through comfortably by going second fastest, but he did so on the hyper soft tyres and might face a shorter first stint that his nearest competitors. The other Red Bull of Daniel Ricciardo was on track at that time too, but while on his flying lap, he was told to slow down and abort his lap, either for an issue, or because the team was certain of Ricciardo making it through to Q3 with his lap on ultra soft. Q3 was a close affair, with the top six less than 3 tenths apart, led by Hamilton, Vettel and Bottas. Grosjean, again best of the rest after his first attempt was at 9 tenths of the pace setter. 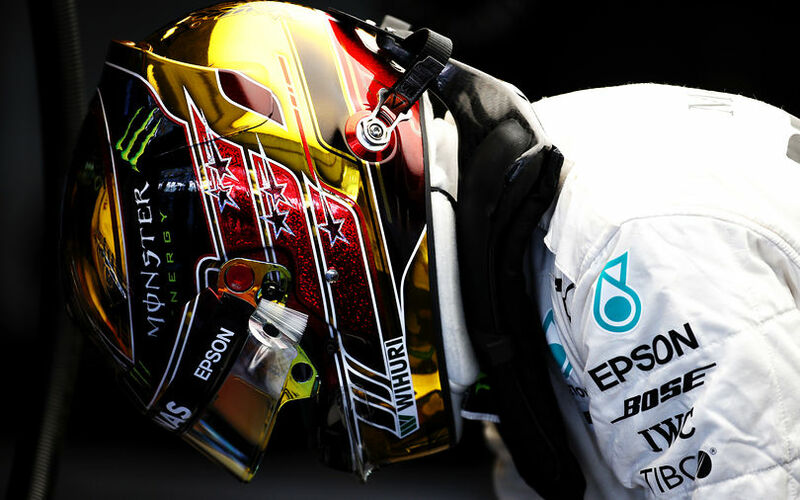 Hamilton recorded another improvement to the track record on his second outing, with soon Bottas improvinng as well to move up into second. Vettel was unable to match those times, despite a purple first sector and therefore ended up third, ahead of Raikkonen. Ricciardo will lead Red Bull's challenge this weekend, qualifying a tenth faster than Verstappen. This put Grosjean in 7th at 1.4s, underlining the gap that currently exists between the top three teams and the rest of the pack.